One of the most used applications in India is WhatsApp, followed by Facebook, SHAREit, Facebook Messenger, and Truecaller, a report has found. In a survey by App Annie, WhatsApp has the highest number of monthly active users. The second application with the highest active monthly users is Facebook. The number of highest active monthly users is for both Android and iOS platforms. These days applications are increasing at rocket speed making humans more and more addicted to them. From WhatsApp to Paytm, there are a bunch of apps that we cannot imagine our lives without. These applications have made our lives trouble-free and effortless, in just one click we are good to go. 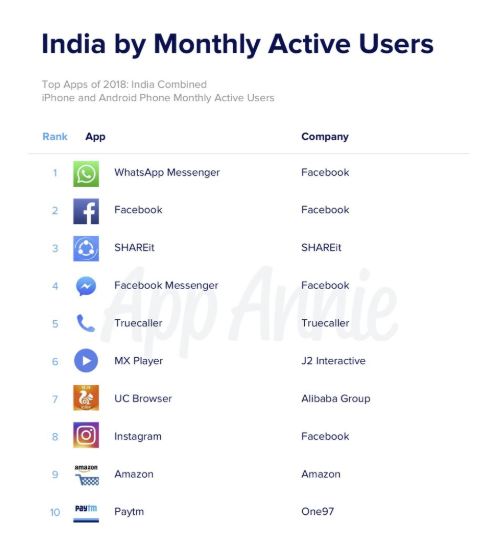 App Annie, an in-app analytics firm in recent research took out a list of top Apps that has the highest number of Monthly Active Users in India. The research showed that WhatsApp is one of the top apps which had the highest number of monthly active Android and iOS users in India and then Facebook fell on the list and Shareit and so on. The report also displayed a list of Top games of 2018 and Top companies of 2018 for iOS and Android users separately and both combined. Here is a list of top 10 apps of 2018 by monthly active users. From the findings by App Annie, it is shown that Facebook-owned WhatsApp has beaten Facebook in terms of Monthly Active Users in India. WhatsApp owned the top spot followed by Facebook, SHAREit, Facebook Messenger, Truecaller, MX Player, UC Browser, Instagram, Amazon and Paytm. Though the report does not mention specific numbers, it is certain that WhatsApp has beaten Facebook in terms of popularity and monthly active users in India. While by Consumer Spend, App Annie ranked Netflix the top app of 2018 combined iOS and Android users, followed by Tinder, Google Drive, Hotstar and others. Linkedin also found its place among the Top apps of 2018 by Consumer spend.